When you ride a GSX-R750™ you have the privilege of riding a legend. It's championship-winning sport bike that not only ushered in the era of race bike replicas—it's also set records that will never be broken. On the road or on the track, the GSX-R750 delivers a riding experience that is a breathtaking combination of outstanding engine performance, crisp handling, compact size and light weight. 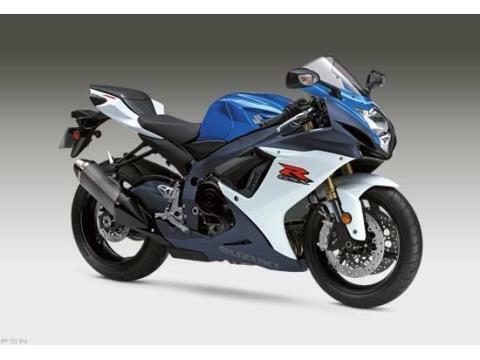 The key to the GSX-R750's racetrack-conquering speed and agile handling is the pairing of its powerful inline four-cylinder, 16-valve 750 cubic centimeter engine with the lightweight, compact chassis of a 600 cubic centimeter Supersport. It's a winning combination that allows any rider to experience the exhilarating rush of a middleweight AMA Supersport bike. For 2012, the GSX-R750 is available in a new Marble Daytona Yellow / Glass Sparkle Black color combination. Available in Metallic Triton Blue / Glass Sparkle White and new Marble Daytona Yellow / Glass Sparkle Black. A 750 cc, four-cylinder engine with a race-proven over square bore / stroke ratio provides exceptionally potent, high-revving performance. Advanced, race-developed transistorized ignition control circuit helps maintain more precise ignition timing across the range of engine temperatures.